This post has already been read 5079 times! It is clear from major press coverage that virtual reality is garnering, that there is a huge amount of development interest across multiple industries, including video streaming, gaming and simulated learning. 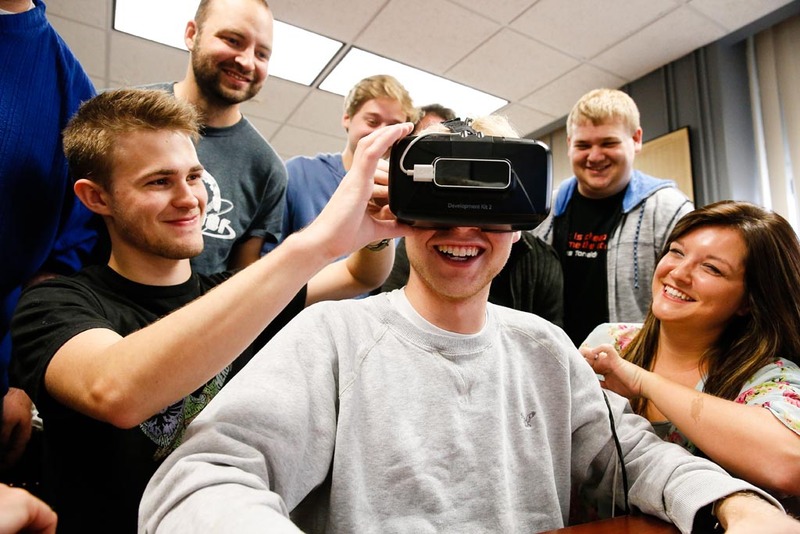 This explosion of awareness and enthusiasm from students stimulated the UNK Computer Science and Information Technology department to adopt virtual reality resources and lab space for student projects, starting in 2014. 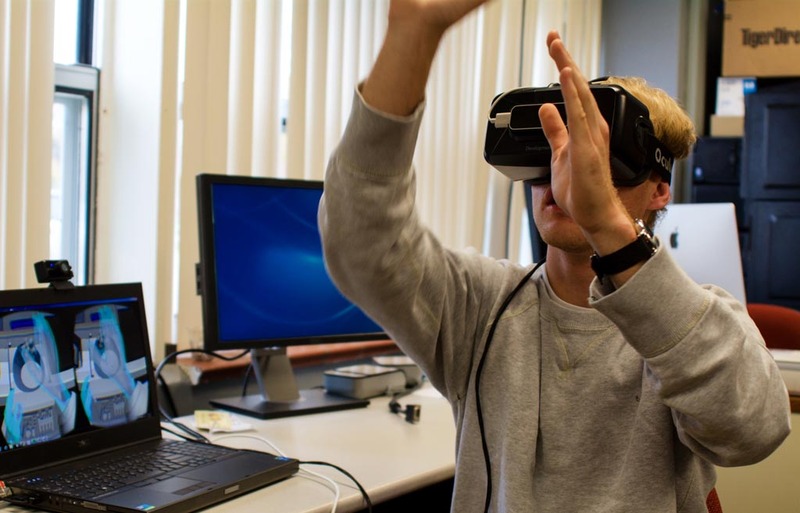 CSIT students quickly became innovators in the virtual reality world using these resources. Each new version of VR hardware and/or software, and each new semester, brings opportunities for CSIT students to try new things and express their creativity. Additionally, each student project inspires more students to try their hands at VR development. Daniel Russel, a May 2015 Computer Science Comprehensive graduate from Commonwealth of the Bahamas, presents his project to businesses and CSIT students at the CSIT Spring 2014 Project Demonstration Day. 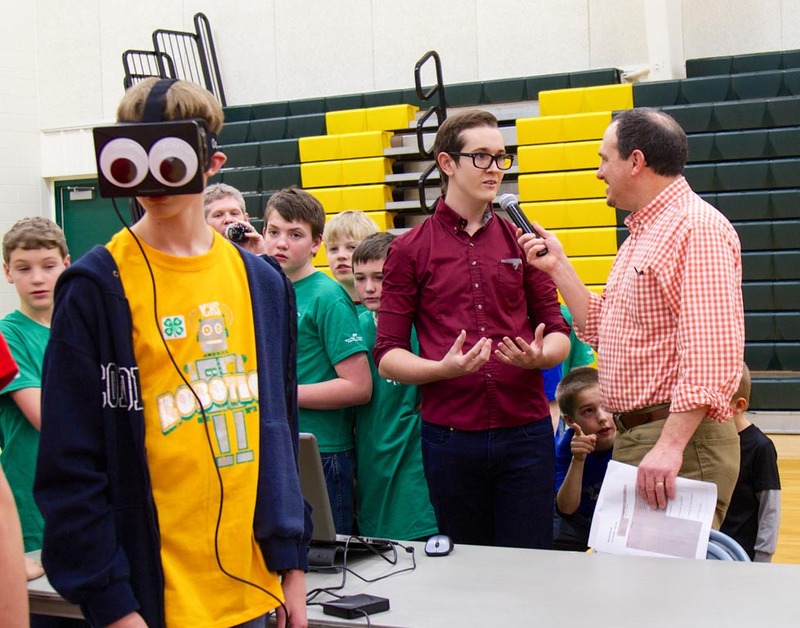 Daniel Russel demonstrates his snowboarding simulator to middle and high school students at the 2014 Nebraska Broadband Conference and a2015 First Lego League Robotics Competition in Kearney. In the spring of 2015, two students created virtual reality projects in the Artificial Intelligence course, using the Oculus Rift Development Kit (DK) 2. Ian Lim, an Applied Computer Science junior from Grand Island, created a “robots versus humans” VR first person shooter game for the Oculus Rift KD2. Lim used the Unity Game Development Engine, along with TF3DM and Turbo Squid for 3D modeling. The most challenging aspect of the development process was making the robot have enough intelligence to target the human controlled player, but not enough intelligence that the human controlled character always lost. Sam Middleton, an Applied CS junior from Kearney, created a VR motorcycle racing game that involves a player surviving on a motorcycle while avoiding walls and an artificial intelligent agent. Players wear the Oculus Rift DK2 headset to look and feel like they are actually riding the motorcycle. 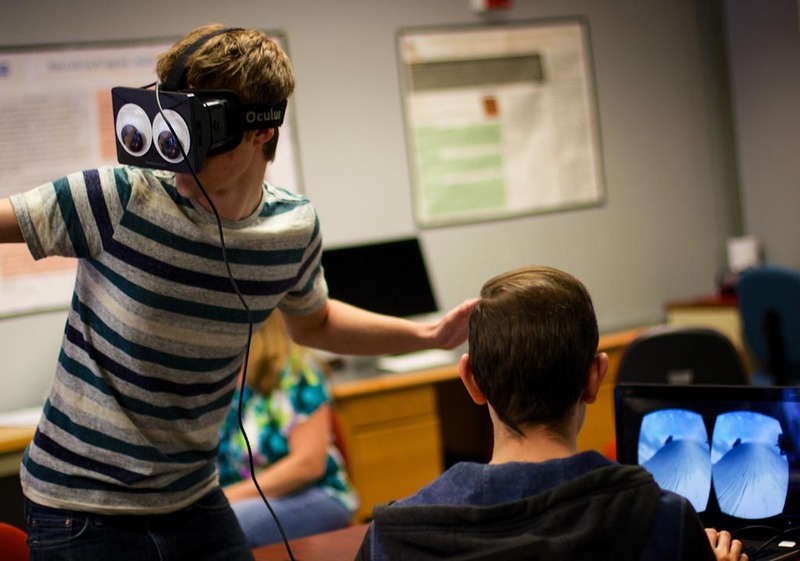 The fall 2015 semester brought about more CSIT student virtual reality projects. Middleton set out to improve his motorcycle racing game in the CSIT 422 Computer Graphics course. Unfortunately, innovating in the VR world has its challenges. As he started developing the improvements of the game in the latest version of the Unity game engine, his motorcycle that worked perfectly in the previous version now moved straight up instead of straight forward. Back to the drawing board! He was able to solve this problem and also added the ability for the human player to jump over walls. 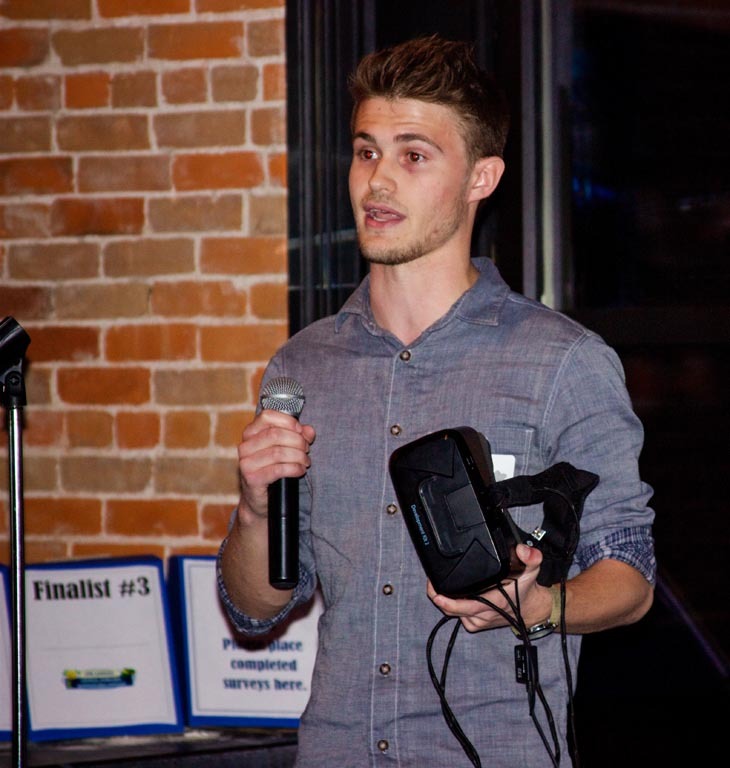 Middleton submitted his game to the 5th annual Central Nebraska business idea contest in October 2015 and won. Middleton plans to further develop a commercial version of his game. “With the rising market in virtual reality gaming, such a business would thrive in the coming years. And unlike the physical products of most businesses, games could be mass-produced cheaply through digital online marketplaces,” said Middleton. Lim also continued his VR work in the fall 2015 semester and created a 3D explorable world for his CSIT 422 Graphics class project. In this world, the user enters an elevator to go to different floors, which each containing a new world to explore. 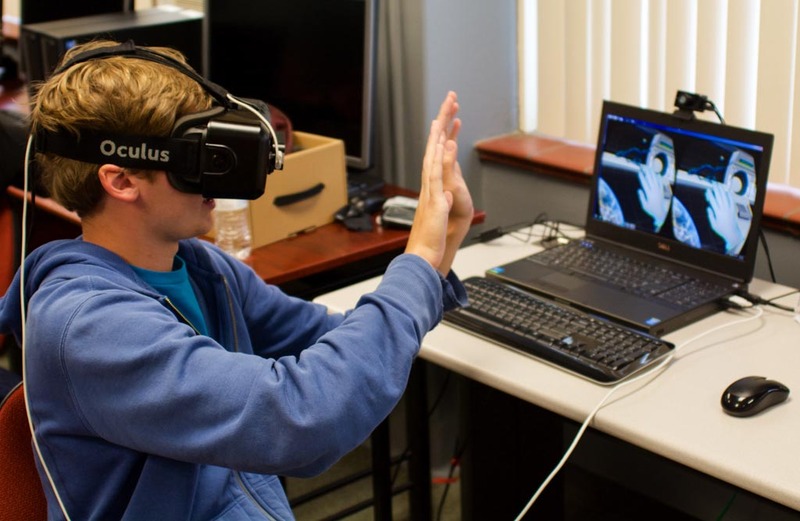 Matt Lueck and Ben Bomberger, CS Comprehensive seniors from Kearney, tried their hand at creating a virtual reality project in their Senior Capstone course, as they developed a VR 3D boxing game for the Oculus Rift. It was built using Unity with Leap Motion, using Blender for the 3D modeling. The Leap Motion allows the VR system to “see” the player’s hands. Unfortunately for Lueck and Bomberger, it only recognizes a hand when all five fingers were visible. This made it difficult to see the player’s fist, as needed for their boxing game. Their game turned into more of a “slapping” game. 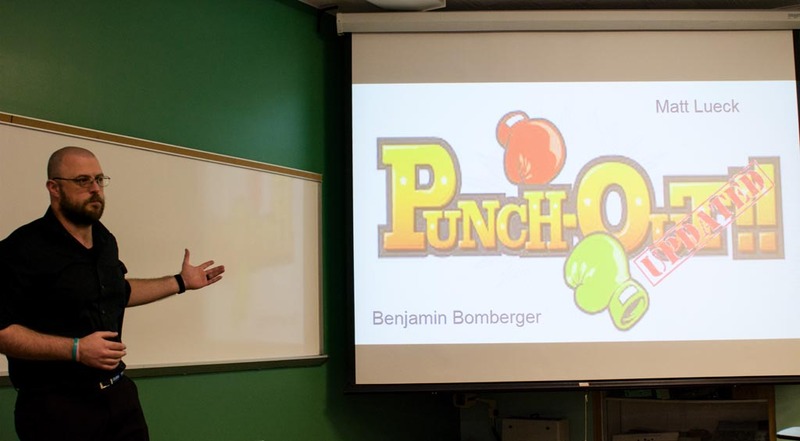 Ben Bomberger presents the Virtual Reality 3D Boxing game at the Fall 2015 Project Demonstration Day. The first commercial release for the Oculus Rift is now available for pre-order, with shipment sometime in July. The Oculus Touch, which is a handheld tracked controller that brings the player’s hands fully into VR, is planned for release in fall 2016. This technology will allow Lueck and Bomberger’s boxing game to function more realistically. Virtual reality will be a major contributor to new technologies and innovations for years to come. The UNK CSIT Department plans to stay on the leading edge of this field, proving the tools and resources needed to inspire student creativity and innovation so they can be successful in their VR classroom projects – enabling them to be successful entrepreneurs in virtal reality. Ben Wagner uses the Oculus Rift VR headset.